Vision Therapy are special exercises that are tailored to the particular needs of the patient. The goal of these exercises is to teach the brain and the eyes to work together more effectively. 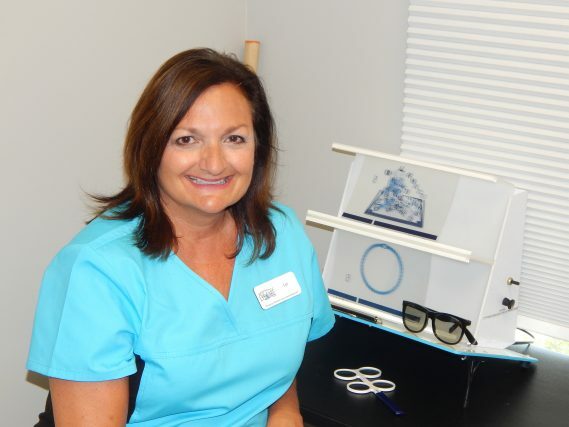 Liz Compton is one of our Vision Therapists in Charlette, NC. She loves working with children and their success is her passion. The children love her so much the lifelong skills they are learning at each therapy session are easily achieved. We asked Liz to describe herself and here's what she said. I have always enjoyed working with people and helping them. Having been in the corporate world as a Banking officer, merchant salesperson, indirect lending assistant vice president and running my own business for 14 years; it was time to do something that I felt would truly make a difference in the lives of both children and adults. I am a family person first, married 35 years with 4 wonderful adult children. My love of being a grandmother has brought so much joy to my life. I became a vision therapist while taking a break from the corporate world. I had a regular eye appointment with Dr. Marcussen 5 years ago this month of March. Having an instant connection, both being Ohio State fans, we began to talk. She said that her Vision Therapy Dr. was in need of some help. We emailed each other and the rest is history. Dr. Gesford trained me while I also self-studied many hours. Here I am 5 years later working with Dr. Ashe. I enjoy working as a Vision Therapist because it is very rewarding in many ways. When a person is seeing double, they cannot read fluently because of tracking problems or may have an amblyopic eye (lazy eye); the challenge is real. Some people have constant headaches. After guiding patients through therapy and seeing them cry because they saw 3D for the first time in their life as an adult, is an amazing feeling. Many children have low self-esteem when they arrive, but once graduated from vision therapy they feel much better about themselves and their visual systems. I enjoy coming to Complete Eye Care to help people, never dreading the work day! My work style, due to my background, I feel is efficient and organized. My prior experience has given me the ability to understand different personalities. I try to be compassionate and caring as well as maintaining patience. Having fun but staying on task is of importance! What are the skills required for a vision therapist to success in her work? The skills to succeed as a vision therapist are many. Loving the job is the most important. Being as knowledgeable as possible always helps with understanding how the eyes are reacting during therapy. Understanding children of all ages and being able to relate to adults is a must. Staying positive and maintaining a good therapist and patient relationship is very important. How do you encourage the child to keep going even if they are feeling down? If a child is feeling down, I encourage them by first asking them if they would like to talk. I maintain that vision therapy is never a test. Whatever the patient may see is always the correct answer. I always show compassion and caring toward them as a person. Trying to build them up is very important while still keeping them on task to work hard. Concluding thoughts on how Vision Therapy can help Vision therapy will help with visual skills as well as correcting certain vision problems. Vision therapy is a therapy for the eyes. The brain must be retrained to train the eyes. Once vision therapy is accomplished it will make a child or adults life easier. A patient will accommodate the insufficiency of both eyes working properly together. Once the eyes become a team, school and work become easier. Life becomes less stressful. I have seen vision therapy change many people’s lives. 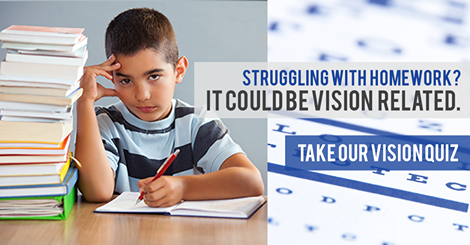 Find out if your child may need Vision Therapy.